Starting each post about art materials, I want to write that this one is my favourite. But frankly speaking, I still can't choose! 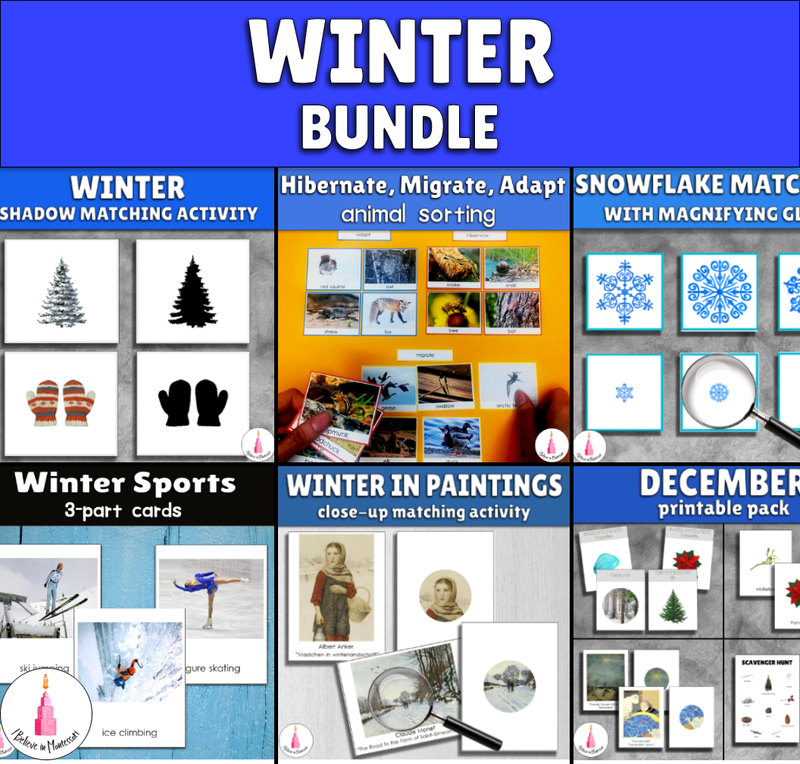 All my art printables took me a lot of time to make (like really a lot!) and often it was not that easy. I am not some art expert, I even haven't visited some art class when I was young. Thus, I attended some art courses for kids while I was at school and results were pretty. My mom probably still keep several of my paintings from that times. But we never discussed painters or movements there. That is why sometimes it was quite challenging to choose artworks. However, it was very interesting as well! This type of material was the first art Montessori material that I observed. Montessori trainer from Austria showed it to us during one of the workshops. 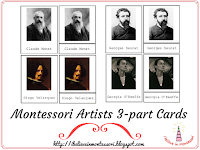 I was amazed by the ability of Montessori system teach art. I was inspired and from that moment I started creating my own art materials. So this material was a starting point in my art series of printables and I have a special attitude towards it. This material seems so fabulous to me. It has a bit of a challenge and it is interesting to work with! With the help of this cards, Child will learn to recognize two paintings made by the same artist. He will also enjoy the beautiful art. Paintings cards go in two sizes. You can choose to work with bigger or smaller cards. Each card has the name of the artist, his portrait and painting name on the back side. 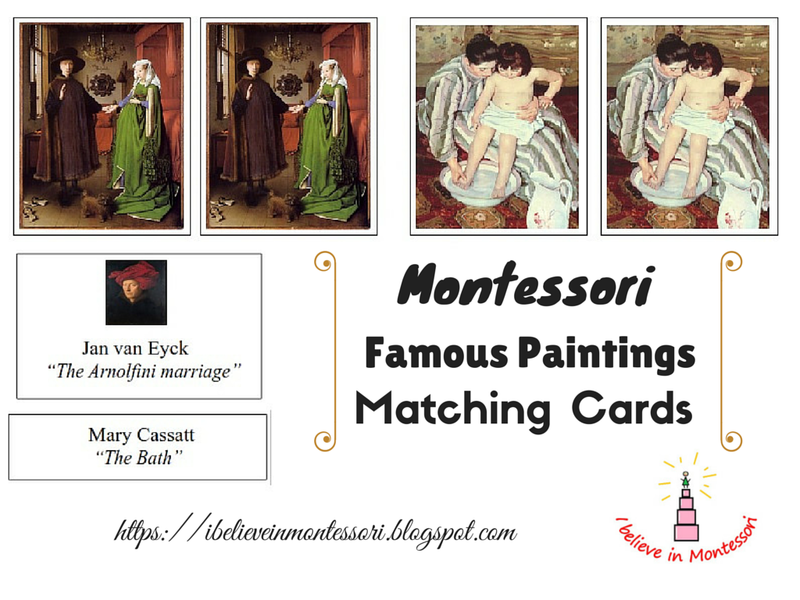 The material also includes labels with painting name for each card to pair to paintings to learn their names. 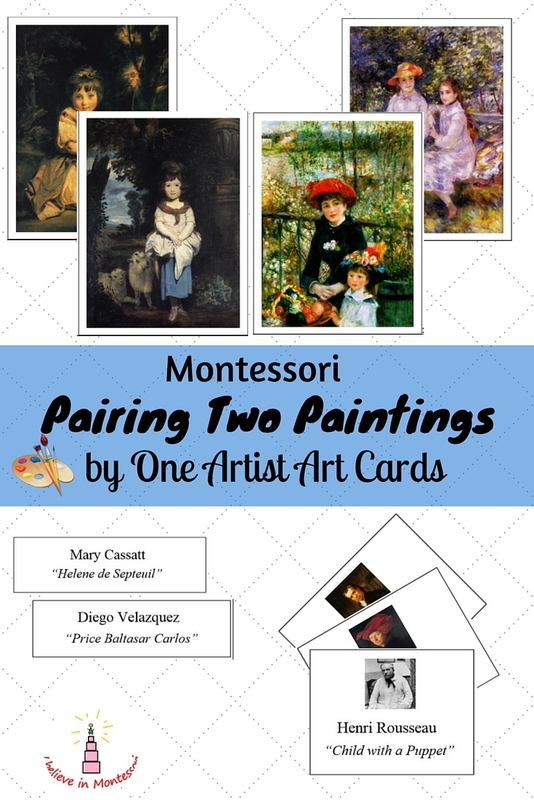 The material includes works of such wonderful artists as Peter Paul Rubens, Leonardo da Vinci, Mary Cassatt, Albrecht Durer, Claude Monet, Albert Bierstadt, Georgia O’Keeffe, Henri Rousseau, Ito Jakuchu, Joshua Reynolds, Jan van Eyck, James McNeill Whistler and other. 52 labels with "name of artist and his painting"
1. Print all the cards and labels. 2. Cut all of them. 3. Glue the cards with photos of artists+their names+names of the paintings to the back of the corresponding paintings. Control table from pages 28-33 will help you to match labels to paintings. 5. I strongly recommend separating all the cards at several sets, because there are a lot of them and it is impossible to use all of them at once. You can make 2 sets including 13 pairs of cards each or you can make even 3 or 4 sets depending on the age of the Child and his abilities. 1. Tell the Child that now you are going to look at the beautiful art created by wonderful people. 2. Take one set of cards and line them up along the left side of the mat. If you use a large number of cards, use two columns. 4. If they don’t match compare it to the next card, and so forth. 5. Continue until the match is found. 6. 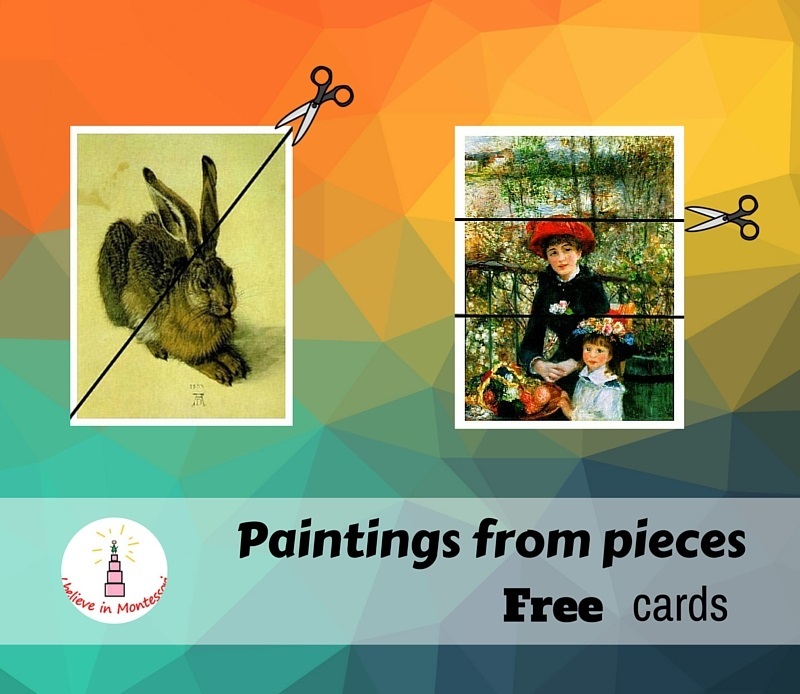 Turn all the cards pair by pair to the back side and check if the portrait of the artist and his name are the same. This will serve as a control of error. 1. 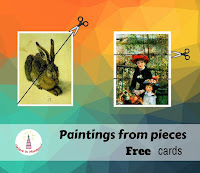 Take one pair of cards created by one artist and show it to the Child. Tell their names. 2. Take the name card, read it out loud and put it to the corresponding card. 3. 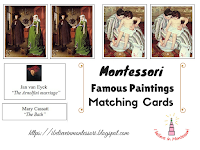 When cards are done, turn them to the back side and compare the name of the artist and paintings. This way Child will understand how the control of error works here. Katherine, This Art appreciation series is fantastic! So great to have the downloads available at TPT. I plan to encourage all my AMS interns to look into it for their classrooms. 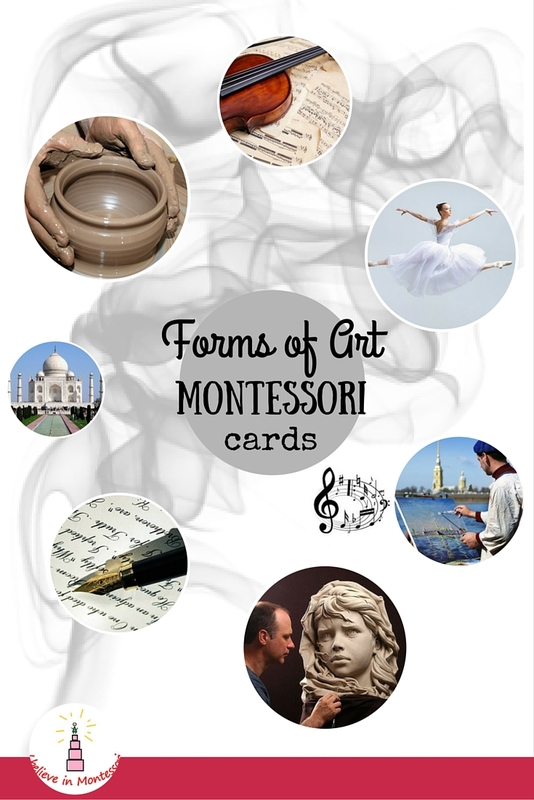 It would be a GREAT topic for a Montessori Synthesis Project! Thank you very much! I really appreciate it! I dreamed for a long to create the ultimate series for art appreciation and I am really happy with how it turned out!